When I first started my blog, I was asked why it’s called Evocative Matters. It has a double meaning that I like: matters that are important to me, i.e., the arts and the people involved in the arts that I am able to be a part of and share; and the importance of being aware of something that can awaken, stir or inspire — hence, Evocative Matters. However, it’s not just the arts I find to be evocative. Current events most definitely can be as well. For example, Russia bombing Syria; Planned Parenthood being attacked; and mentally unstable people with guns who shoot people — while nothing yet has been done about it. These are just a few examples. There’s always more. Always. It’s just a matter of what you’re willing to dig into to learn about, and hopefully do something about it. It’s the latter that rarely seems to happen. The Oregon sheriff announced this morning that neither he nor the investigation will announce the name of the shooter out of respect for the victims and their families. To a certain extent, that does make sense. But, shouldn’t we as the public know who killed those innocent people, and forever changed the lives of the people who were wounded and/or witnessed the horrific event? Shouldn’t we be aware of his background and who he was? Maybe then we can see how it could have been prevented? Or at the very least be aware of the signs to look for? But, then again, who would want to be on the look out for those kinds of signals? Would anyone want to? People don’t pay attention while driving, much less to other people even in their own circles. We all get so wrapped up in our own lives, sometimes it’s more than difficult to look beyond our own front yard. I wonder, how would life be different, if people as a whole did pay attention? What is it that we can all relate to that evokes actual change? Or are we all so desensitized that it doesn’t matter? What is it that we are afraid of and why? I keep thinking the world needs more love. More positive mojo. More light. The love is there. Is it we just don’t hear about it like we do the tragedies? Or, maybe we don’t want to hear about it because it’s not as exciting or dramatic — it doesn’t make for “good” water cooler chit chat. But we do need more love. More positive mojo. More light. Even when we think we have enough, there still needs to be more. Because if there is more, then maybe there will be more empathy, more understanding, more patience, more peace, just more “good”. But are we too concerned with playing it safe? And what is safe? As an artist – be it the creative type, a philosopher, or a thinker… you don’t want to be safe. You want to explore. Discover. Create. Feel. As terrifying and overwhelming and painful as that may be, breakthroughs of growth are made when you do go there… right? So, why is it we get too caught up in fear? Fear of exploring, discovering, creating, feeling…. I’m hoping for the good. 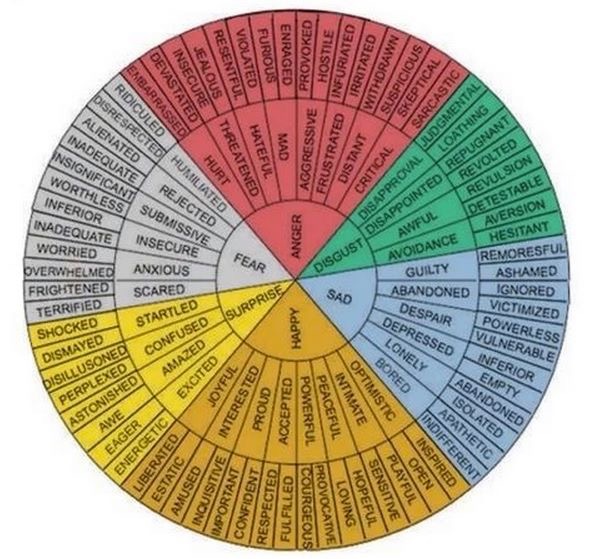 A “feel” wheel from the Writers’ Circle on Facebook — sometimes it’s nice to be able to put a name on it. ← Hey, Y’all! Check out Bless Her Heart Productions’ The Bar!